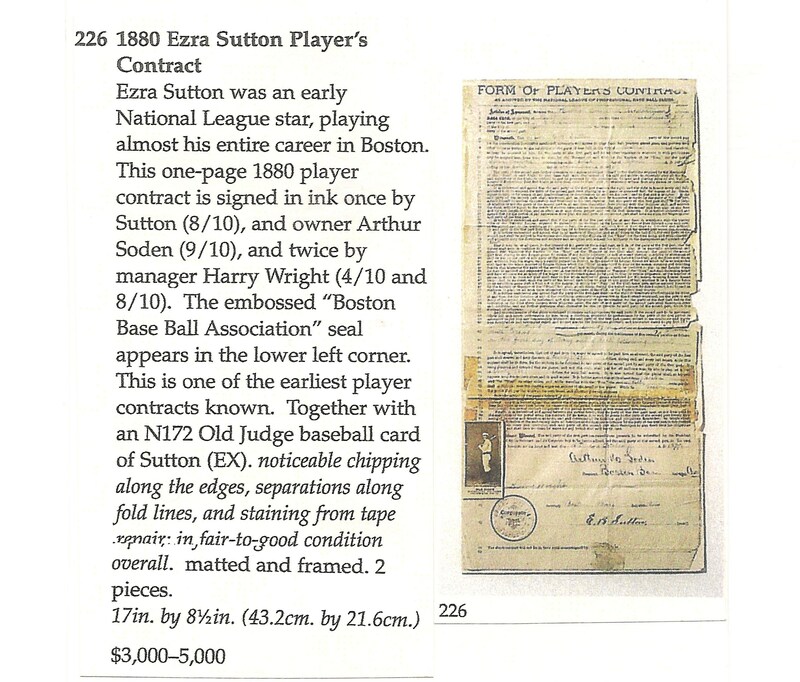 The Mysterious Journey of Ezra Sutton’s Stolen 1879 Boston Baseball Contract: From Barry Halper to Sotheby’s to Hollywood. Next Stop Home at the New York Public Library? The historic contract was signed in 1879 and for many years preserved in the hands of Baseball Hall-of-Fame pioneers Harry Wright and A.G. Spalding. It was once featured in a special exhibition at the world’s greatest research library and it was for years hidden-away on the walls of a New York Yankee owner’s New Jersey home. It was sold for a hammer price of $4,312 on the floor of the world’s most famous auction house and most recently resided in a collection that also features the famous “Bill Buckner/Mookie Ball” from the 1986 World Series, owned by the songwriter who wrote Taylor Dane’s 1980s dance hit, “Tell it to My Heart”. 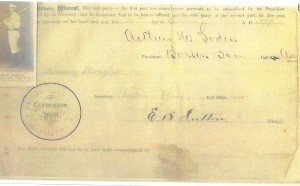 Yes, Ezra Sutton’s 1879 Boston Red Stockings contract gets around. 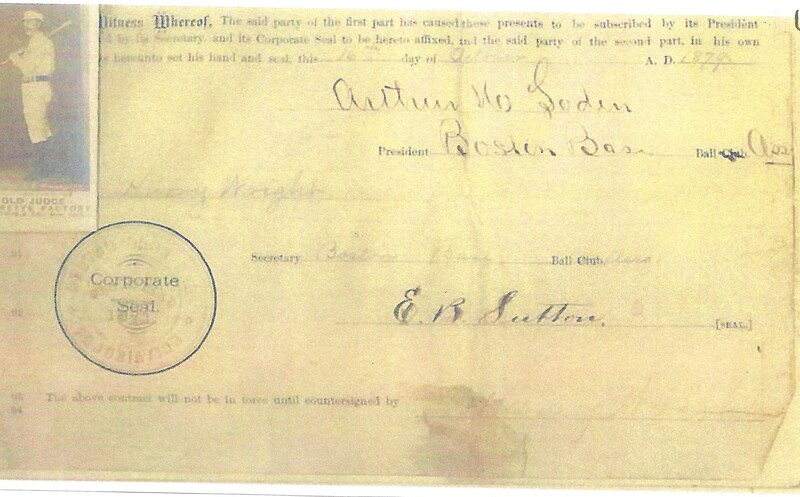 October 16, 1879 (Boston): Ezra Sutton meets with Boston owner Arthur Soden and manager Harry Wright to sign a “Form Of Player’s Contract” securing his services for the baseball season of 1880. Player Sutton, magnate Soden and the Hall-of-Fame manager Wright each scrawled their John Hancock on the contract and the transaction was officially executed with the raised seal of the Boston Baseball Association. September 28, 1895 (Philadelphia): Sutton’s 1879 contract is saved in the personal archive of Harry Wright who prepared the codicil to his last will and testament stating: “All of my books and memoranda bearing upon or concerning the National Game of Baseball….I give and bequeath unto the National League and American Association of Professional Base Ball Clubs and their successors in the sincere hope and wish that they may use them as a nucleus or beginning of a historical collection of memoranda and facts bearing upon our grand national game of baseball…” The contract most likely spends time in storage at the National League offices in Chicago. June, 1907 (Point Loma. California): Having taken possession of the Harry Wright archive and the baseball library of Henry Chadwick, magnate Albert Goodwill Spalding built a fireproof vault in his California residence to safeguard the Sutton contract and other treasures of the game from the threat of fire. Having traveled “coast-to-coast,” the Sutton contract rests in Spalding’s vault for over a decade. 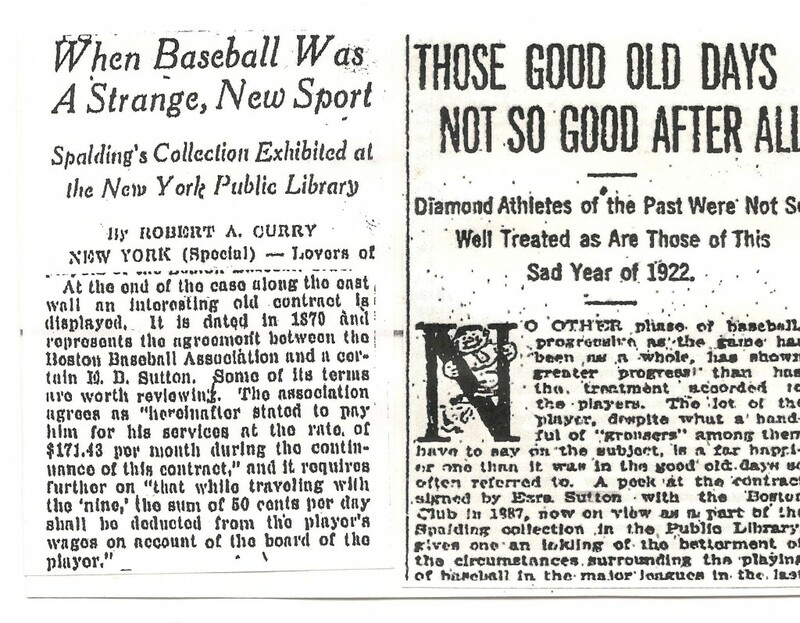 July 17, 1921 (New York City): Six years after Spalding’s death, the New York Times reports the arrival of the A. G. Spalding Baseball Collection to the New York Public Library. The archive is donated by Spalding’s widow, who states that she has decided to send the collection to New York so that it could be “most accessible to the greatest number of lovers of our national game.” The Ezra Sutton contract arrives at the library in what is described by the NYPL as a “package of correspondence” that once belonged to Harry Wright. The Sporting News also publishes an article devoted solely to the contract at the time of the NYPL exhibition. The article, entitled “Those Good Old Days Not So Good After All,” utilizes the contract to illustrate how poorly players were treated by ownership in the 19th century. Summer of 1953 (New York City): Dr. Harold Seymour and his wife Dorothy research the Spalding Collection at the New York Public Library’s main branch on 5th Ave. and 42nd Street. In the course of their research they encounter the Sutton contract, which had by 1953 been pasted into one of the four scrapbook volumes of the incoming correspondence of Harry Wright. The Seymours documented the information contained in the contract on several sheets of paper, which were included in their research notes for Seymour’s 1956 Cornell dissertation and the later book, Baseball: The Early Years (Oxford, 1960). August 22, 1983 (New York City): The New York Times reports that at the instigation of baseball historian John Thorn, The Sporting News, the Baseball Hall of Fame and the Society for American Baseball Research have partnered with Thorn to fund the microfilming of the manuscript holdings in the NYPL’s Spalding Baseball Collection. 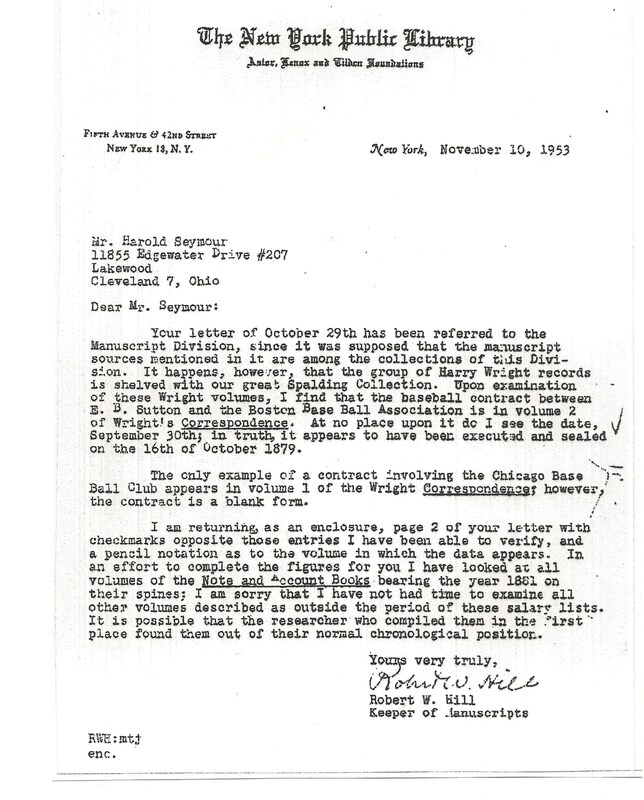 In the course of the microfilming process it is discovered that three entire volumes of Harry Wright’s incoming correspondence are missing. The whereabouts of the 1879 Sutton contract officially becomes a mystery. Spring of 1984 (Livingston, New Jersey): After sitting in the Harry Wright Correspondence Scrapbook (Vol.2) on the shelves of the NYPL’s special collections since the 1920‘s, the Sutton contract mysteriously appears in an article written by Bill Madden for the 1984 New York Yankees Yearbook. In a profile of the baseball collection of Yankee minority owner Barry Halper, the contract appears hanging in a frame on a wall in Halper’s Livingston, NJ, home, among scores of other baseball treasures. 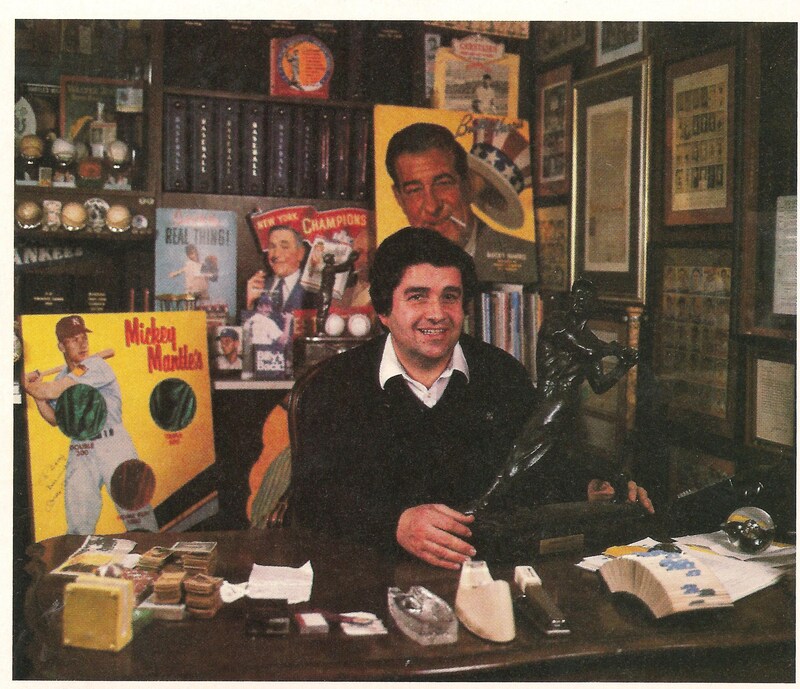 Barry Halper appears c. 1984 with his baseball treasures on display in his Livingston, NJ home. The 1879 Ezra Sutton contract, originally part of the NYPL’s Spalding Collection, appears hanging on the wall in a frame directly above the head of the bronze baseball figure held by Halper. Spring of 1995 (Livingston, New Jersey): Sports Illustrated publishes a feature article on Barry Halper and his massive baseball collection, entitled “The Sultan of Swap.” The 1879 Sutton contract is highlighted as one of the most important pieces in the Halper collection along with a copy of the Knickerbocker Base Ball Club’s rules and by-laws. Sports Illustrated incorrectly describes the Sutton contract as, “the earliest known player contract, that of E.B. Sutton of the Boston Baseball Association in 1879.” While the Sutton contract is rare, there exist at least fifteen other agreements pre-dating it. The Sutton contract as it appeared in the 1999 Sotheby’s Auction catalogue for the Barry Halper Collection sale. October 1999-Summer of 2009 (Beverly Hills, California): The Sutton contract travels back west with new owner Seth Swirsky, acclaimed songwriter and author of the best-selling books, Baseball Letters and Something to Write Home About. The Sutton contract joins an eclectic and impressive group of baseball artifacts selected by Swirsky and is included as a featured item from his collection on his website, Seth.com. The contract appears amongst other storied items from the game’s past, such as the “Buckner/Mookie Ball” from the 1986 World Series, along with Bill Buckner’s spikes; the letter that banished “Shoeless Joe” Jackson from baseball; Reggie Jackson’s third home run ball from game six of the 1977 World Series; and the 1882 letter that admitted the New York Giants into the National League. 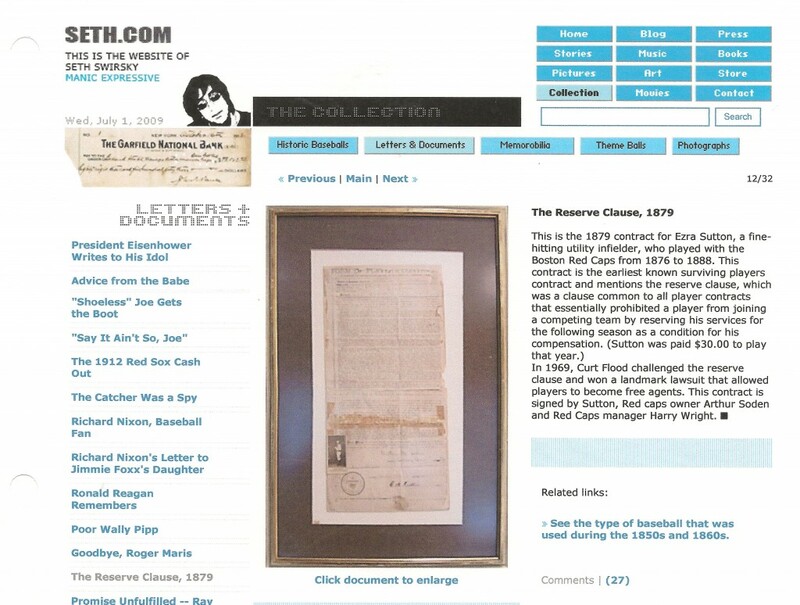 Seth Swirsky’s website, seth.com, featured the Sutton contract amongst other impressive artifacts like the letter that banished “Shoeless Joe” Jackson from baseball. The contract appears in the same frame it was housed in at the time of the 1984 photograph taken at Barry Halper’s house. In July of 2009 a controversy developed as rare 19th century letters written to Hall-of-Famer Harry Wright were offered in Hunt Auctions’ MLB All-Star Game FanFest Auction. Allegations were made by collectors and historians that the letters were possibly stolen from the NYPL’s famous Spalding Collection. The New York Times published an article reporting how baseball historian Dorothy Seymour Mills led investigators to important information that helped prove that two of the letters were the property of the New York Public Library and the letters were pulled from the sale . One of the items Mills provided was the 1953 NYPL letter documenting that the 1879 Sutton contract was once part of the Spalding Collection. This letter and the original Seymour research notes from their work at the NYPL in the 1950s are located in the Rare and Manuscript Collection of Cornell University. Subsequently, the Boston Herald published a story including information claiming that the Sutton contract and other items from the famed “Barry Halper Collection” had been stolen from the New York and Boston Public Libraries. Boston Herald reporter Dave Wedge contacted New Jersey auctioneer Rob Lifson to inquire whether Lifson had any knowledge that the contract sold by Sotheby’s was stolen. Lifson, a Halper associate and cheif consultant to Sotheby’s for the 1999 Halper sale, stated he had no knowledge that the contract was stolen, but recalled that Halper had obtained the contract in the “mid-1970s” from pioneer baseball dealer Goodwin Goldfaden. Seth Swirsky declined to make any comment regarding his ownership of the 1879 Sutton contract. Sources indicate that, like other purchasers of stolen items in the 1999 Sotheby’s Barry Halper auction, Swirsky was a typical good faith buyer who thought he was acquiring an artifact with clear title. A prominent collector, who asked to remain anonymous, referred to Swirsky and other buyers as victims in the Halper stolen-artifact scandal. Special Agent James Margolin in the New York office of the Federal Bureau of Investigation could not confirm or deny whether the FBI had seized the 1879 Sutton contract from Swirsky or if the collector had voluntarily returned the document. Margolin could only confirm that the federal probe into the Spalding Collection thefts “was on-going.” Although numerous items like the Sutton contract have been traced back to the Halper Collection, the FBI has also declined to reveal whether their investigation has uncovered where and when Halper originally acquired the stolen goods. The 1879 contract no longer appears on Swirsky’s website, Seth.com. Sotheby’s did not respond to inquiries into their sale of items owned by the New York Public Library. Sotheby’s also declined to comment on how good faith buyers would be reimbursed for purchasing stolen items. It is likely the buyer and the auction house, itself, might have recourse against the estate of Barry Halper, who died in 2005. This is a most interesting piece and a critical undertaking. What is most interesting is this parallels what has more or less been considered, by experts to be a myth in the art world: theft of a priceless artifact and subsequent sale to a monocled, possibly bloated, definitely insatiable collector. In that scenario the piece sits hidden from view from nearly everyone or is traded through various underworlds (see “Stealing the Scream” by Dolnick. What makes this important is these pieces sat in open view of everyone (and were documented by major periodicals). I remember reading about Halper in Smithsonian magazine many years ago and thinking: “My god, what a collection”. I, as I’m sure others, marveled at his good luck and skill in obtaining his collection. Unfortunately, but perhaps necessarily, the Halper Collection may be reduced to just another confidence game. I don’t know how much clearer the record can be that the Ezra Sutton contract is owned by the NYPL. 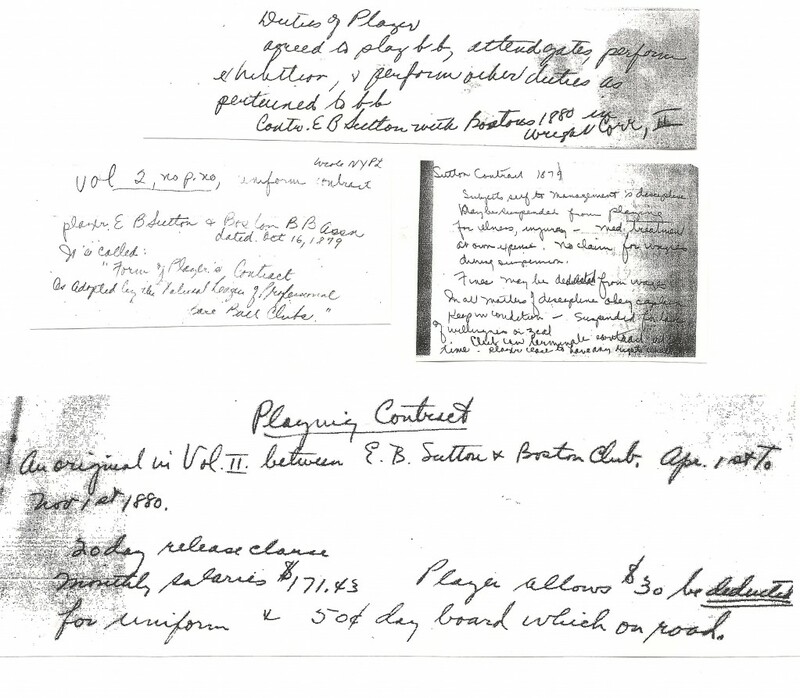 Surely the notes I took on it, which you found in my own handwriting, prove that it was part ofj the NPL collection back in the 1950s, when Seymour and I were working on the first volume of our Baseball series for Oxford University Press. It is the most well documented stolen institutional artifact in history. Documented by a letter from NYPL to Seymour; your multiple original research notes from the 50s now housed at Cornell; period news accounts in the Sporting News and Christian Science Monitor c 1921; the footnotes from your Oxford titles; and last but not least your eyewitness testimony that you held the contract and scrapbook in your own hands before it was stolen from NYPL.